Megastar Chiranjeevi can make a lot of difference to Kaththi remake. Home/NEWS/Megastar Chiranjeevi can make a lot of difference to Kaththi remake. A little tweaking of the script and the characterisation to change to the needs of the telugu audience can make a huge difference to the Kaththi remake. With dual roles Chiranjeevi can give a total make over to the character of Kathireesan as this character can be tweaked to match that of Auto Johnny of Rowdy Alludu. While the other character of Jeevanandam can be a soft one, just like the character of Kalyan in Rowdy Alludu. Megastar Chiranjeevi can bring in a lot of variations and also be able to pull of a stupendous all round performance, if proper care is taken and enough comedy is added to the movie. 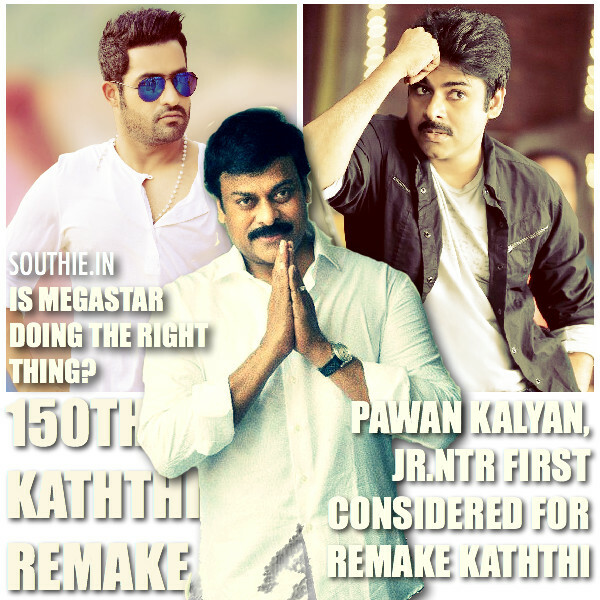 Pawan Kalyan and NTR were considered for Kaththi Remake? If Chiranjeevi remakes Kaththi he has to make sure, that its better than the original, with more comedy and hero elevation scenes. V V Vinayak can deliver a blockbuster like Tagore which in itself was a remake. One is a Massy Character and the other a soft character, both the characters find ways to fight for the poor, with their own signature style. V V Vinayak who is crazy about dual roles, and the way he presented Tagore with Chiranjeevi, will be raring to go.